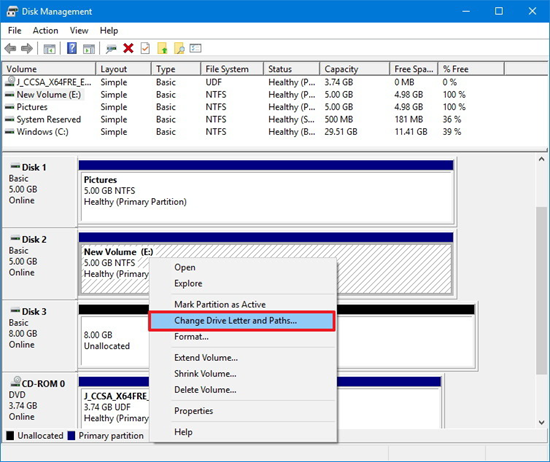 There are many reasons why SD card is not detected on Windows 10. If you are experiencing the same issue, you have to exclude the cases one by one to solve this problem. Never hesitate to restart your computer. Most of the time, it settled question. As for unsolved situation, six solutions are provided below to work out the trouble of (micro) SD card not showing up on Windows 10. Sometimes it is the computer interface that breaks, rather than SD card. In this case, just connect your SD card to another computer or Android phone. Alternatively, try another SD card to check the interface. There is no shortcut if you want to test the SD card not recognized or working on Windows 10. Step 1. Right click “My Computer” and select “Disk Management”. Step 2. In Disk Management, your SD card will appear as a removable disk. Check if it has a drive letter like D or E.
Step 3. If not, right click the SD card and select “Change Drive Letter and Paths”. Step 4. Click “Add” and select a drive letter, then click “OK”. Your SD card would be working in File System along with local disks. There is a knowledge point that write protected SD card will not be displayed on other devices, except the original one. So if you did lock your SD card before, the first thing is to remove write protection from SD card. Check the lock switch beside the card or use disk utility. It can also fix SD card not showing up on Windows 10. Step 1. Click “Start” and enter “Device Manager”. Select it from the results. Step 2. Find your SD card and right click it, then select “Update Driver”. Step 3. Select “Search automatically for updated drive software”. If there is no new driver, try to look for one on the manufacturer’s website and follow the installation wizard. Step 4. If it doesn’t work to update driver, just right click the device and select “Uninstall”. Then restart your computer, and Windows will reinstall the driver by itself. Disabled SD card will not show up on Windows 10. The steps to enable this function are the same as above. First find your SD card in “Device Manager” and right click it. If it shows “Disable Device”, then you have already enabled SD card reader and there is no need to do anything. If not, just select the option “Enable Device”. Then Windows 10 could detect your SD card normally. Troubleshooter is a built-in repair tool in Windows 10. It helps to fix common computer problems. You can also use it to solve (micro) SD card not detected on Windows 10 problem. Step 1. Click “Settings”> “Update & security”> “Troubleshooter”. Step 2. 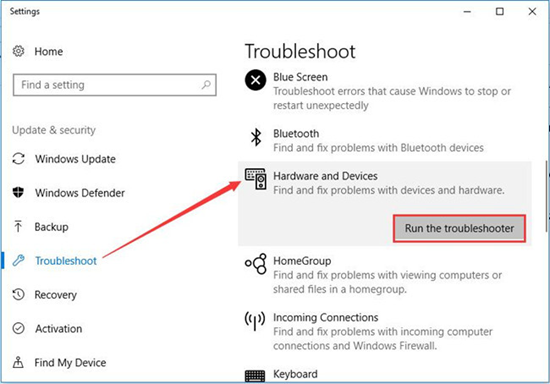 Select “Hardware and Devices”, then click “Run the troubleshooter”. After detecting the problem, the troubleshooter will fix it automatically. Accidentally deleted or lost important photos, videos and music on your SD card? Don’t worry. Just try RePicvid Free Photo Recovery to help you recover deleted files from SD card with simple clicks. This software offers “Advanced Settings” for better user experience. Also, you’re allowed to preview the recoverable files one by one. For detailed steps, please refer to how to recover deleted photos/videos from SD card.